It is the year 2012, and so up to this point, humanity has made triumphs in science of great significance. We have invented the Global Positioning System, modified the DNA of species to give them desired traits, and we have generated electricity using electrolysis. However one thing that us as humans will never be able to do in our existence is understand free will and consciousness. Sheep, for a replicated process, provides no answers and no leads. Scientists will never be able to understand consciousness, because scientists will never be able to understand what makes an object be an animate object, as there is no force at play to investigate. ready to be explored but only in the present, and that they collapse on improbability once actions in the present collapse a wave function, among all possible universe combinations. This still doesn’t explain quantum mechanics, but instead adds further complexity and more unexplained phenomena, providing a one size fits all but every size is being sold and brought, scientific model. Repeating earlier points; scientists will never be able to understand consciousness, because scientists will never be able to understand what makes an object be an animate object, as there is no force at play to investigate. Brain scans, DNA, Carbon-14 or microscopic observation won’t help. If there are no factors to investigate something, it results in renders that thing unable to be investigated. Using the analogy of a policeman not being able to locate a stolen necklace due to having no factors to go on, the same basis can apply to concepts in science such as consciousness,to show how humans will never be able to understand consciousness. This essay about Underpinning Factor Interpretation, aims to explain such a thesis. We can treat Cancer due to research in radiation. We likely will be able to treat Alzheimer’s in the future due to research in Stem Cells (Alzheimer’s Society). When the Wright Brothers had invented the first aeroplane contrary to popular belief that they could, they had factors to go on – which were aeronautics (Howard 1988, p. 30). When Marie Curie and her husband Pierre discovered radiation through the discovery of the elements Polium and Radium, they had factors to go on (Cruising Chemistry). Science has advanced the way that it has in our 21st century life, with our GPS technology, because we had factors to go on. Unless a supernatural higher-sentiment being descends upon this Earth tomorrow, we will not be able to understand consciousness, as we have no factors to go by, to enable us to further our understanding on such matters. A psychological test known as a mirror experiment, measures a sign of consciousness. It involves getting monkeys in front of a mirror to check whether they are conscious of themselves. A Magnetic Resonance Imaging scan which provides detailed images of the body using strong magnetic fields, measures a sign of consciousness. The brain is the most advanced machine in the world, and we don’t understand it, so the only brains we can test are the ones from living animals. DNA is not considered to be a factor under the theory, but instead the concept of forensics, would instead be a factor. There are factors we can use for forensics, and they are called flies, as in the animals that fly around with wings. They were the first forensics ever discovered or invented, of which the occurrence happened in France. In France, flies would be used be used to locate dead bodies, in order to solve murder crimes (Earth Life). If one had knowledge and belief in the Underpinning Factor Interpretation in the 1800s, and were asked whether it would be possible to solve the unsolved murder crimes in the future, their answer would be yes, as they already have factors in the realm of Forensics – flies. However for consciousness, there are no factors we can use to understand that. We can use MRI scans to detect the presence of consciousness, but the one thing we can never do, is understand the nature of consciousness itself, because we have no factors to go on. For forensics the answer is yes,and for consciousness the answer is no. One could argue that it’s a fallacy for the universe to be rigged in such a way so that we cannot ever be able to understand consciousness. Under the theory, it is not the universe that is rigged, but rather the restraints of our human cognitive ability. So far in the process of abiogenesis which is the process of artificially creating life from inorganic matter, we have got to the process of creating amino acids, which is a building block that forms proteins and can modify organisms with it (BBC News 2011). There are constraints that stop humans from being able to understand the nature of consciousness, and nobody knows what the constraint is, expect that we know it exists. There is a thin line between life and death, which becomes apparent in the times the times of when neighbouring premises are isolated from the scene and non-existent. We don’t know why Brazil nuts only grow in the rainforest and not in a greenhouse. We can’t get cloning right as cloned offspring are subject to an unusually high risk of multiple diseases despite a replicated reproduction process (BBC News 2003). Some heart transplant patients are known to receive memories or alternate personalities of their donors (Channel 4 2009). There is a stage when an embryo gets fertilised, that when observed under a microscope or any other apparatus, that there is a time period that goes undetected of which something happens. It is only when you encounter unexpected exceptions in the realm of science for the thin line between life and death, do you really begin to understand how bizarre and supernatural, life is, or consciousness for a better word, actually is. This provides support to the argument that abiogenesis is impossible. The only reason why science has advanced the way that it had progressed, is because we have been investigating the things of which we had factors to go on. We may not have had all the factors we needed, but we did have some factors to work with – and that is all that matters. One might argue that the interpretation runs on a logical fallacy to suggest that scientists will never have a factor because they never have one. Whilst those suggestions of the theory are the case, the logic behind it, is instead that scientists will never have an understanding because there is no factor. One always follows the other, and the understanding always follows the factor. Without possessing a factor, no understanding can happen. To whether more factors became known to us – which breaks the rules of the theory – from single-cell organisms up to us as humans as we evolved from them, the answer is still that us as humans cannot gain any more factors than our innate capabilities that gave us the factors we were to stick with. This will be explained later on in the essay. There are a certain amount of possible outcomes which can occur due to the options that present themselves. If there are no factors that can be used to assess something, it simply cannot be assessed. The only reason why science has progressed the way it has, is because we’ve been investigating the things we had factors to go on. One might ask whether we’ve always known about these factors, all the way back to the beginnings of science, with no factors being discovered. To answer this, earlier points can be further illustrated. It was Galileo who discovered that the Earth revolved around the Sun, and not the other way around. One might call him one of the first scientists. But the Greeks who lived long before him, defined the Sun to be in the centre of the universe at one point, with the Earth revolving around it. The difference between the Greeks and Galileo, is that Galileo had access to a telescope in the future, so he could actually prove the claims that the Catholic Church condemned him for. Just like how Galileo had his factors, so did the Greeks. Going further back in time to the Geocentric Model which pitted the Earth at the centre and the Sun revolving around it, it was a view which wasn’t challenged until the 17th century. Claudius Ptolemaeus was wrong in his theories. As wrong as Ptolemaeus was, him mapping out the Geocentric Model was a Science, as he used observation to challenge and define the current model to create a pattern of uniformity that could stand up to the test of time. In this case, it stood up for hundreds of years. The Greeks had their two theories of mapping out the solar system, which both were a science despite not having access to a telescope. Repeating a point made earlier among others: we may not have had all the factors we needed, but we did have some factors to work with – and that is all that matters. Scientists will never be able to understand consciousness, because scientists will never be able to understand what makes an object be an animate object, as there is no force at play to investigate. The only reason why science has advanced the way that it has, is because we have been investigating the things of which we had factors to go on. 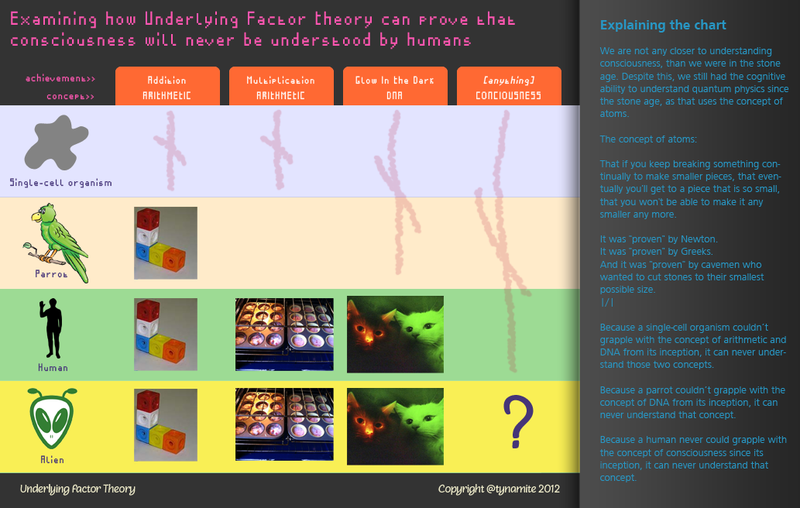 In order to understand phenomena X, it is necessary to follow factor F. It is impossible to understand X without the lead that F gives. In addition to this, for all X’s to be understood in the future, it must be the case for at least one of the factors for its corresponding F’s has to be known. Not all the factors are needed to understand X, but at least one of them. We may not of had all the factors needed to understand something, but we did have some to work with – and that is all that matters. There are factors which come into play as to how cavemen could come to understand Quantum Mechanics. The concept of atoms: “That if you keep breaking something continually to make smaller pieces, that eventually you’ll get to a piece that is so small, that you won’t be able to make it any smaller anymore.” It was “proven” by Newton. It was “proven” by Greeks. And it was “proven” by cavemen who wanted to cut stones to their smallest possible size. It is human nature to be inquisitive and question the nature of life, and existence itself. Now to take into account whether other animals on Earth have the same factors such as birds and single-cell life forms, to ask whether the progression of time is bringing about new abilities to createnew factors, rather than them be fixed or static. First things first, if anything is making humans catalogue history, dolphins being able to understand the concept of currency, and single-cell organisms not being intelligent enough to count, it is the bidding of evolution and not Underpinning Factor Interpretation. The first humans weren’t born utilising all the factors to their greatest extent, but they were very well capable of knowing them. In terms of knowing, humans are born tabula rasa knowledge wise, they learn and use factors, but humans do use all the factors. Nobody is born knowing factors, in the same way that a new-born baby doesn’t know how to count to 10. If hypothetically there were only 100 factors, humans are capable of using 100 factors, they collectively use 100 factors, and individually use 1-100 factors. This can be given with further explanation with the following analogy, which introduces the 5 rules of Underpinning Factor Theory. Imagine that humanity is building a house of cards over time. It is a known fact that a house of cards gets more complicated to make, as you continue making it. This is so because every new card you add makes it easier for the structure to fall. Humans are capable of using 100 factors (1), and for this specific house of paper cards, they are only using 1 factor to build it (3). As time progresses, the advancement of humanity is happening, so as time goes on, the humans are increasingly knowledgeable and resourceful at making the house of cards, yet they are still using the same factors (4). Humans are capable of using 100 factors. Humans collectively use all 100 of the factors. Humans individually use 1-100 of the factors. Humans still use the same factors throughout time, but they just get better at using them. To ask whether first humans collectively knew all the 100 factors, the answer is yes. The previous generation also knew all of them; they just got better at using the ones they had. “Humans still use the same factors throughout time, but they just get better at using them.” Also whatever the predecessor was to humans, they didn’t know all the factors. As the species evolved in intelligence in the time that it emerged from evolution, that species had more factors, than their predecessor. Each successor evolution spawns, provides that species with more factors, however a species cannot gain any more factors; they just get better at using the ones they’ve got. In the same way that a single-celled organism cannot do arithmetic, a parrot can only do addition up to 5, and we can do the full scope of arithmetic; a single-celled organism cannot understand death, a parrot cannot understand DNA, and a human cannot understand consciousness. Why? Because the only reason why science has advanced the way that it has, is because we have been investigating the things of which we had factors to go on. Because us human beings are struck under the awe and complexity of our scientific and artistic achievements, we are under the illusion that our knowledge knows no bounds. Considering that lesser intelligent beings have a smaller scope for understanding things than we do, it perfectly follows that us humans would also be incapable of understanding certain concepts. A parrot or single-cell organism does not have the ability to understand certain things that we could try to teach it, if we both spoke the same language. Considering that we are living animals too, it perfectly follows that there are concepts in the universe that we cannot grasp. A single-cell organism does not have a factor for counting, so it cannot count. A parrot does not have a factor for multiplication, so it cannot apply multiplication. A human does not have a factor for consciousness, so it cannot understand consciousness. Countless research into studying lesser intelligent animals, have shown that they are incapable of understanding certain concepts that us humans can understand. Humans are not the exception of animals who can defy the constraints that our innate natural intelligence gave us. One of the things that us as humans cannot grasp, is consciousness, as we do not have a factor for it. Regarding that scientists are trying to investigate abiogenesis, it is evident that humans needed a factor from the beginning of our existence, as it is missing from us today. The same basis applies for the parrot with literature. There will be no such thing as a abiogenesis scientist wondering why he didn’t think of something before to spring life into existence, because we already know as much factors as we initially know, and cannot know any more. To be able to understand Underpinning Factor Interpretation to its fullest extent, one has to stop thinking about the creative and scientific things we have yet to achieve, and start thinking about the cognitive and technical limitations of human beings. Us being the smartest creatures on the planet, doesn’t make us exempt or invincible, as we are still vulnerable to a limited scope of ability like the parrot or dolphin. A single-cell organism cannot understand arithmetic. A parrot can only add numbers up to 5, but cannot perform other arithmetic. A human can perform the full scope of arithmetic. If we spoke the same language as a higher intelligent being, then us humans would not be able to understand those non-understandable concepts of mathematics, as wouldn’t have enough cognitive intelligence (or capacity) to be able to understand the information being given to us. There are certain concepts within the realm of arithmetic, that us humans do not have the cognitive ability to understand. Everything in the universe (especially the macro world), and more specifically living species, follows a pattern. If there is evidence that a pattern is evident without abnormalities, it is safe to assume that the observed pattern is correct, and will always follow in the pattern as seen. A number in the 3 times table will always have its digits be a multiple of 3 once added together. Handle is to wooden door as lid is to box. Those are two patterns. If there is evidence that a pattern is evident without abnormalities, it is safe to assume that the observed pattern is correct, and will always follow in the pattern as seen. For example, the pattern 123123123123123123123123123123123123123123123123123123123123123123123123123123123123123123123123123… is true. A single-cell organism cannot perform arithmetic. A parrot can only add numbers up to 5. A human can perform the full scope of arithmetic. If you were to speak the same language as single- cell organism or parrot, cognitive here as it would anywhere, would mean that the organism would not be able to understand you regardless. A single-cell organism does not have the cognitive ability to understand arithmetic. A parrot does has a limited cognitive ability to understand arithmetic, but it can only add numbers up to 5 and cannot perform other arithmetic. A human can perform our full scope of arithmetic. Now to move onward from technical ability onto cognitive ability. If you were to speak the same language as single-cell organism or parrot, cognitive here would mean that the organism would not be able to understand you regardless. A single-cell organism does not have the cognitive ability to understand arithmetic. A parrot has a limited cognitive ability to understand arithmetic, but it can only add numbers up to 5 cannot perform other arithmetic and nothing else. A human can perform our known full scope of arithmetic. If humanity was to end in the year 3000 and the full scope of arithmetic ability is 100, and we are back here in the year 2012, the full scope of human technical and cognitive achievement (not prediction) would be less than 100, because our achievement at this point in time would not yet be realised. Still would the amount of factors innate in the human race would be the same. In this paragraph, full scope refers to the innate full scope that humans had from the beginning of existence. The matter of technical ability can now be dropped from this essay, and from hereon only cognitive ability will be referred to. Cognitive ability means what minds can grasp. Regarding higher intelligent beings, for argument’s sake, this being has a cognitive ability of 200. We still have 100. There is a pattern of uniformity that this theory uses to assess the constraints on human ability, and now to move onto explaining exactly why humans won’t ever be able to understand information of a higher cognitive ability. The reasoning for why us humans would not be able to understand information of a higher cognitive ability, is because all the different species can only make use of the factors that were innate for them to have at the beginning of that species’ existence. We don’t know if we are currently using all of our innate abilities, and if that’s so, there is no way we can know what they are, or how they’ll manifest themselves. Again, Scientists will never be able to understand consciousness, because scientists will never be able to understand what makes an object be an animate object, as there is no force at play to investigate. The innate ability to understand consciousness never existed in the first place!!!!!!!! 1) Humans are capable of using 100 factors. 2) Humans collectively use all 100 of the factors. 3) Humans individually use 1-100 of the factors. 4) Humans still use the same factors throughout time, but they just get better at using them. We are not any closer to understanding consciousness, than we were in the Stone Age. However, we are any closer to understanding atoms, than we were in the Stone Age. As said before; The concept of atoms: “That if you keep breaking something continually to make smaller pieces, that eventually you’ll get to a piece that is so small, that you won’t be able to make it any smaller anymore.” It was “proven” by Newton. It was “proven” by Greeks. And it was “proven” by cavemen who wanted to cut stones to their smallest possible size. The same cannot be said for abiogenesis or consciousness. To look at whether something is possible to be understood by humanity, you have to first look at whether the concept (not the thing) you are trying to understand, was present (innate) in humanity in the first place (its start of existence). This is why the Underpinning Factor Interpretation is impermeable. A parrot can understand the concept of arithmetic but not the concept of multiplication. The parrot is not any closer to understanding the concept of multiplication from when parrots first inhabited, the Earth, but it is closer to understanding the concept of addition. And that is the reasoning that forms the basis for the theory, and the proposed uniform pattern that underpins it. Underpinning Factor Interpretation does not say that given that we haven’t understood consciousness so far, it seems very unlikely that we’ll figure out in the future; but instead says that because wen haven’t understood it to some extent so far, that it’s absolutely impossible that we’ll figure it out in the future. If we didn’t understand a concept to some extent in the Stone Age, we can never understand it now or in the future. In the same way that a single-cell organism and parrot has no cognitive ability to do apply multiplication, as we wouldn’t be able to teach it that if we spoke the same language as them; we also wouldn’t be able to understand consciousness, as likewise, we would also not have the cognitive ability to be able to understand those concepts. This would be so, because, we are not any closer to understanding consciousness, than we were in the Stone Age. And with that, explains the reasoning for the theory, and the pattern of uniformity pattern that underpins it. Underpinning Factor Interpretation makes two bold claims one’s innate cognitive ability is defined from birth and cannot change, and that there is no such thing as a modern idea that isn’t a refinement of a Stone Age (or earlier) one. Intelligence is regarded as more dependent on genetic factors than it is on environmental factors. Intellectual stimulation in pre-school is known to raise children’s IQ score for a few years, but it does not permanently increase IQ scores. For the most part IQ scores do not change over time. “There is evidence that maintaining an intellectually stimulating atmosphere boosts some cognitive ability, but these changes are not permanent and do not have much effect on IQ scores.” (Success Findings). It is keeping the brain active that stops an IQ score to falter, and it is intellectual stimulation, diet and sleep that makes one realise their full innate IQ potential. Results also show that the decrease of IQ due to a poor diet is small (NHS Choices).In 2013 it was discovered that 60% of the variation in people’s school grades, come from genetics, over half (The Guardian). People with brain damage are known to have a lower IQ, because their brain got damaged. Due to the way that evolution progresses the whole of humanity, so there is nowhere on the world map to find people of yesteryear in this year, in order to find people with less cognitive ability living among humans today, is to look at people who are disabled. “Dyslexia is the most common form of language-based learning disability. Approximately fifteen to twenty percent of the population has some form of language-based learning disability. Dyslexia is primarily a reading disability, and there is evidence suggesting that Dyslexia is a condition that is inherited. Dyslexia is a condition that is found in both females and males from all ethnic backgrounds. Moving onto the second claim, about all ideas being a refinement of an earlier one, one only has to look at the revolutions of which humanity has progressed through, to realise that all revolutions came from a hereditary line of earlier ideas. For the history of atoms that are known to our scientific model, our path of discovering them has only happened because we had historical knowledge recorded that we could base our foundations on when making advancements in technology. The factors we use to make those advancements remain the same however. The path from the 2nd to the 3rd steam motor came about because James Watt figured out how to push a piston back and forth in its cylinder – of the previous model. The path of discovering atoms from Brownian motion up to Einstein proposing that liquids are composed of atoms; followed a path of Classical Thermodynamics, Molecular Kinetic Theory of Heat, which both opposed each other. About imagination and stimuli; it has been found that the raw material for our dreams come from our recent experiences. Upon this finding, scientists have named this memory. There is a thing as declarative memory, because it stores the information that you can declare you know, such as your name or the 9 times tables. Amnesiacs still can dream about recent memories, despite not being to add new memories to their declarative memory. This suggests that we have an implicit memory that allows us to remember things we don’t even know we remember. (MSNBC 2011) Recent events being more predominant on dreams than past traumatic ones, supports this evidence. (The Telegraph) All this shows that not only is the application of imagination affected by the amount of innate intelligence we have, but it is also affected by our memories for increasing the pool of applicable indicia. To finalise the second claim that all our ideas have been a refinement of an earlier one, to make this argument contort full circle, the probability of our sexuality is defined by genetics is uncertain. Scientists have failed to find a gene which makes people gay, and have proven that being gay is not genetic. This leads full circle onto the first claim, to touch on innate ability and possibly a lack of free will. Whilst the achievements humans have made culturally and scientifically are of great importance to our understanding of the world and our enjoyment in it; it is important in the realm of science that we don’t forget we aren’t invincible, and also that we have limitations. It is only when we understand the constraints that we have upon us humans, can we begin to truly understand our place in the world, and which concepts in the realm of science we should go forth to investigate next, to further our understanding of the Universe and the world around us. There are things which we cannot comprehend due to our unknown lack of cognitive ability considering we are the most intelligent species on the planet, but we mustn’t let that hinder our curiosity of the existence that underlies the Universe we live in; but at the same time, we mustn’t investigate the concepts which will be fruitless and to no avail. http://alzheimers.org.uk/site/scripts/documents_info.php?documentID=430 [Accessed: 15 Jul 2012]. http://www.bbc.co.uk/news/science-environment-14492948 [Accessed: 15 Jul 2012]. http://news.bbc.co.uk/1/hi/sci/tech/2764039.stm [Accessed: 15 Jul 2012]. http://www.chem.duke.edu/~jds/cruise_chem/nuclear/discovery.html [Accessed: 15 Jul 2012]. http://www.earthlife.net/insects/forensic.html [Accessed: 15 Jul 2012]. http://www.fairtrade.ie/producers/405.html [Accessed: 15 Jul 2012]. Howard, F. (1987) Wilbur and Orville: a biography of the Wright brothers. New York: Knopf, p.30. Transplanting Memories (2009) [TV programme] Channel 4, Channel 4, 09/02/09. world.com/disability/types/cognitive/ [Accessed: 15 Jul 2012]. helps-castle-camps-woman-fight-chocolate-addiction-1-3427341 [Accessed: 15 Jul 2012]. webster.com/dictionary/intelligence [Accessed: 15 Jul 2012]. http://www.his.com/~pshapiro/steam.engines.html [Accessed: 15 Jul 2012]. at: http://www.plosone.org/article/info:doi/10.1371/journal.pone.0002282 [Accessed: 15 Jul 2012]. http://www.simplypsychology.org/operant-conditioning.html [Accessed: 15 Jul 2012]. http://www.sq.4mg.com/IQgenetics.htm [Accessed: 15 Jul 2012]. results.html [Accessed: 15 Jul 2012]. http://www.vaughns-1-pagers.com/history/world-population-growth.htm [Accessed: 15 Jul 2012]. http://webaim.org/articles/cognitive/ [Accessed: 15 Jul 2012]. http://www.msnbc.msn.com/id/3077505/ns/technology_and_science-science/t/how-brain-turns-reality-dreams/ [Accessed: 15 Jul 2012].